Published: Dec. 18, 2016 at 10:52 p.m. Updated: Dec. 19, 2016 at 07:33 p.m. Opportunity is the name of the game in fantasy football. Talent matters, of course, but we want players who see a healthy volume of targets and touches to anchor our lineups, especially in daily fantasy. Every week in the second season of the Opportunity Report, we'll look at all the passing targets for every NFL team and the percentage each player owns. Franchise will handle the backfield touches section this year and his Week 14 piece is tabbed above. J.J. Nelson is a nice addition to an offense, but it's hard to assert with much confidence he's the type of player who needs to be getting 11 targets in a game. That was his highest game since Week 8. The Cardinals do not have much of choice right now with the state of their receiving corps. In the absence of the departed Michael Floyd, John Brown saw his snap rate to go up to 59 percent. The team still does not want to put much onto his plate with his sickle cell trait issue. For the third straight year we are watching Larry Fitzgerald slump toward the end of the season. Since Week 11, the veteran receiver averages 52.6 yards per game and has collected double-digit targets just once, something he did six times in the nine games prior. Taylor Gabriel led the team with six targets but only played 24 total snaps due to a shoulder injury that sent him to the locker room for a while and the game being a blowout. Aldrick Robinson led the wide receiver in playing 81 percent of the team's snaps and made a downfield catch along the sideline and another long catch and run on a seam route. Neither player will have a stable role if Julio Jones returns to take on the Panthers next week, but should he miss another game, either could once again make big plays against that secondary. 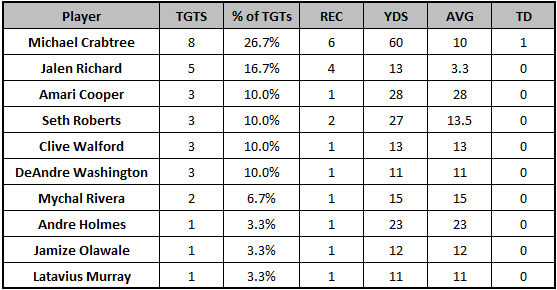 Nothing much changed with Baltimore's passing distribution, as Steve Smith and Mike Wallace led the way, as usual. However, the team did run the ball far more often on Sunday than they had been in the weeks leading up to this. Baltimore handed-off to their running backs 22 times to just 30 pass attempts for Joe Flacco. That may have been due to the windy weather, but with two talented backs and a solid line, it should be more of their approach as they make a run to the playoffs. After trending up in playing time culminating with a 90-plus percent snap share in Week 14, it was wildly disappointing to see Sammy Watkins slip back down to go out on just 64 percent of the plays. That could have easily just been due to the blowout nature of this game, which favored the Bills. Yet, it also just appears we will be playing a guessing game with his health and usage the rest of the way. Let's hope Watkins is more consistently healthy next season. It was right back to work for Alshon Jeffery, who led the wide receiver group by playing on 94 percent of the team's plays. He went long stretches without getting a target, but started to get rolling in the second-half. Perhaps he started to develop more comfort with Matt Barkley as the game went on. Cameron Meredith is established as the No. 2 receiver (89 percent) and Deonte Thompson (71 percent) as the No. 3. Meredith took 73 percent of his plays when lined up in the slot, so he'll continue to see advantageous matchups there to rack up volume. This is a lesson not only in the myth of youth or the unknown and not usage dictating upside, but also that slot receivers like Boyd need a healthy volume to produce consistent big numbers for fantasy. So while it isn't necessarily surprising that LaFell is out-working Boyd, it its shocking that both are so far ahead of Tyler Eifert and his 22 targets over the last four weeks. It appears as if Robert Griffin III is not going to breathe any life into this offense. Terrelle Pryor continues to see necessary volume, but Griffin appears unable to get him the ball down field. A week after flinging the ball without conscience in his start last week, his 8.8 average depth of aimed throw was much more in-line with the middle of the pack among starting passers this week. Corey Coleman led the team by going out on 94 percent of the plays to 83 percent from Pryor. Dez Bryant bounced back after a nine-target, one catch game against the Giants in Week 14. It's been far more good than bad with Bryant since he returned from injury in Week 8. With solid spots against Detroit and Philadelphia to close out the season, Bryant should be able to end the regular season on a high-note. Business as usual in the Denver passing distribution. 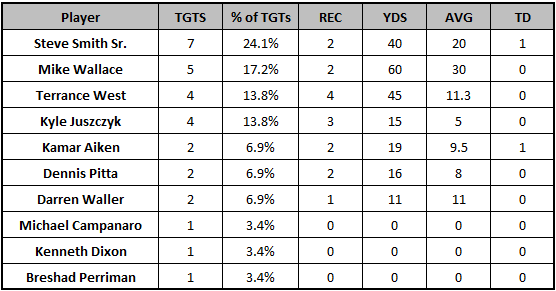 Emmanuel Sanders ran plenty of routes against Malcolm Butler, who is playing well lately. Trevor Siemien chose to pick his spots in other matchups rather than testing Butler with Sanders. Golden Tate has double-digit targets in each of the last three games. He's started to distance himself from the spread-out nature of the distribution in the Lions passing game. The snap counts for all the other players are intact, as Anquan Boldin, Marvin Jones and Eric Ebron all went out for at least 81 percent of the team's plays. The issue is that the team only ran 59 total plays. With the running backs absorbing nine targets, despite Theo Riddick not playing, there's just not enough volume to go around here. Jared Cook turned in his first big game in about a month despite being questionable coming into this week. He went out for 67 percent of the team's plays, so his playing time is not in question. However, the eight targets he earned today were as many as he saw over the previous three games combined. It's hard to chase Cook because he is not a consistent contributor, but he has the ability to produce when his number is called. Davante Adams is on something of an every-other-week plan, and he had two brutal 2015-like drops today, but his playing time and usage is secure. Brock Osweiler got benched in favor of Tom Savage, who clawed the Texans back to win this game. Savage did right by just peppering DeAndre Hopkins with targets, as he finished with a season-high 17. If Savage holds the job going forward, he might have less hesitation to make sure he gets the ball to Hopkins in high-leverage situations. Yes, Phillip Dorsett scored on a long 50-yard deep-shot, but that came on his lone target of the day despite going out for 81 percent of the team's plays. He still has a long way to go before he's considered a true consistent factor. The tight end playing time distribution was interesting. Jack Doyle far and away led the team with a 73 percent share of the team's snaps. Dwayne Allen was down to 47 percent and intriguing athlete Erik Swoope was up to 37 percent. Swoope has the size-speed combination to make plays deep and in the open field, as he did in this game. One has to wonder if an offense quietly starved for difference-makers continues to find ways to get Swoope involved. It's been weeks since we believed we could reliably chase anything from this offense. Even Marqise Lee, who had started to develop some consistency, turned in a zero-catch day despite playing on 94 percent of the team's plays. Jeremy Maclin finally knifed into Travis Kelce and Tyreek Hill's output, especially in the tight end's case. Kelce's five targets in this game were the fewest he's seen since Week 7. Tyreek Hill registered just one touch on the day, despite going out for 53 percent of the Chiefs' plays run. Maclin was on the field for 84 percent and led the team with a 28.6 percent share of Alex Smith's passing targets. This was a predictable disaster for Jared Goff and the Rams offense. It's worth wondering whether some of the Rams younger players might start getting more looks as they focus on planning for their future. While he dropped a long would-be touchdown, Michael Thomas saw four targets on just 13 offensive plays. Tyler Higbee also played 45 percent of the snaps. Matt Moore only threw 18 passes in a blowout win over the Jets, but did more than enough to dice them up. DeVante Parker and Kenny Stills nearly split the secondary receiver duties, going out for 28 and 26 snaps respectively. The Dolphins were also in the three-wide receiver set for 18 of 46 plays run on Saturday. Whether he is healthy or not, Parker has target totals of four, three and three from Weeks 13 to 15. That's not enough to sustain the momentum he was gaining from Weeks 10 to 12. It's astounding that Sam Bradford had 41 targets and Stefon Diggs only got five of them. Adam Thielen went down with a painful-looking injury after playing just 18 snaps, which brought Charles Johnson back into the fold. Jerick McKinnon's passing game role with nine targets was notable. With the Vikings season officially in the drain, we should see McKinnon plenty going forward, especially in passing situations when they take (barely) glorified two-down back Adrian Peterson off the field. It was clear that the Patriots were never going to attack Denver by throwing into the teeth of their secondary, which is why Chris Hogan and Malcolm Mitchell combined to see just three targets. That was predictable. Mitchell was still on the field for 89 percent of the snaps, so he has not lost his shine. New England takes on the Jets next week so both outside receivers will once again be in strong positions to make plays against a cornerback group that is on the other end of the quality spectrum of the one they just faced. Patrick Peterson only covered Brandin Cooks on 16 pass plays and gave up just one catch for 10 yards on his lone target, per Next Gen Stats. For context, the Saints ran over 50 passing plays on Sunday. It was a strange decision by the Cardinals, even though Michael Thomas has been the better player this year. It was clear early in the game that Cooks was lighting up the soft zone coverage provided by the other members in the secondary. Peterson man-handled Cooks in a Week 1 meeting last year, which just makes the lack of in-game adjustment in this game all the more puzzling. While there was plenty of volume here for everyone to produce, we must remember the Saints ran a whopping 83 total offensive plays. That does not happen often, even for a team like New Orleans who leads the NFL in plays run per game (68.8). We know the deal with the Giants. It's all Odell Beckham and everyone else just picks up what little scraps there are. Sterling Shepard is a good player but is living off touchdown production as he hasn't eclipsed 60 yards since Week 3. It appears that Robby Anderson's clear chemistry with Bryce Petty has earned him an expanded role. He went out for 93 percent of the team's plays on Saturday, the second-highest rate among wide receivers. Anderson hauled in a 40-yard touchdown reception, which was his third 40-yard catch over the last three weeks. It's fair to wonder whether Anderson will continue to see the kind of usage and playing time he did with Petty if Ryan Fitzpatrick has to re-take the starting job. Petty suffered a chest injury after getting sandwiched between Ndamukong Suh and Cameron Wake. We've have two more games to go and the Raiders are good so who cares, but Amari Cooper is ending yet another season with anything but a bang. This quiet stretch started even earlier, too. Cooper has not hit 60 yards and scored just twice since Week 9. Yes, today can be chalked up to a run-in with corner Casey Hayward, who is in the middle of a tremendous run covering wideouts. The duo matched up on 21 pass plays, and Cooper saw just three targets and found his long catch for 28 yards. This is not a shot at Cooper's quality of play, really, but there is reason to worry about his fantasy future. Michael Crabtree and his 9.1 targets per game is once again on pace to out-target Cooper (8.4) on the season. He's not going away any time soon. So, Cooper is (at best) the 1a receiver on a team that ranks in run play percentage on the season. That's not the ingredients of a WR1 in fantasy. Despite Ryan Mathews absorbing 20 carries, Carson Wentz still attempted 42 passes in this game. Outside of Jordan Matthews and his 11, the distribution was widely spread out. Trey Burton's playing time fell back to the pack (25 percent of plays) this week after 19 total targets the last two weeks. Nelson Agholor appears to be well out of the coaching staff's doghouse, as he led the wide receiver group by playing 99 percent of the team's plays. Ladarius Green was carving out an essential role and played on a season-high 57 percent of the snaps yesterday. Unfortunately, he suffered a concussion in this game and that's been a serious problem for him in the past. One has to wonder if he misses multiple games as a result. Sammie Coates popped back up in this game, playing 40 percent of the snaps and earning four targets (with a 29.8 average depth of target). Coates played 15 percent of the snaps in the six games preceding this one after Pittsburgh's Week 8 bye. Perhaps they are begging to work him back in as a deep threat. Tyrell Williams and Dontrelle Inman are clearly the top-two players in this passing game right now, and they were No. 1 and No. 2 in the target distribution. They are really the only players we should be monitoring in this offense, even with Williams' slow day. Antonio Gates led the tight end group in snaps played with 35, but Hunter Henry was not far behind with 29. In somewhat of a shock, there does not seem to be a big emphasis in forcing Antonio Gates any touchdown records. There's not much to see here. Younger players like Aaron Burbridge saw more playing time (62 percent of snaps) with Torrey Smith inactive and Quinton Patton suffering an in-game injury. The 49ers rank 29th in pass percentage the last three weeks and Colin Kaepernick has completed just 36 passes over that span. This was the game that so many were waiting to see for Tyler Lockett, as the second-year wide receiver finally put the full range of his powers on display. He made tough catches, ran clean routes and then stung the Rams best corner, Trumaine Johnson, for a 50-plus yard touchdown reception. Lockett matched Jermaine Kearse in play participation (63 percent) and led the team in targets, while registering an 11 average depth of target to show that he's more than just a deep threat. It's hard to know whether Lockett's emergence will make him a viable threat in the last two regular season games this year, but we are seeing why he was a potential sleeper before a PCL injury this year. As Graham Barfield noted, the Buccaneers averaged 69.9 plays per game in Week 1-11, second-highest in the NFL. Over the last month they have run just 61.8 plays per game, falling to 18th most. Not so coincidentally, Mike Evans has target totals of 11, six, eight and eight in that span, whereas he averaged 12.1 the first 11 weeks of the season. Tampa Bay has slowed down the pace of their offense, which is helping them win more, but also taking out potential volume in their offense. The Titans did a job to move No. 1 wide receiver Rishard Matthews away from Marcus Peters at left corner, despite Matthews taking the majority of his snaps on the season at right wideout. Matthews had just one catch on four targets at right wide receiver today, but one for 19 yards on three targets from left wide receiver and two more for 81 yards on two targets when lined up on the interior. Delanie Walker was able to come away with a usable fantasy day, despite playing the Chiefs who are wildly tough on tight ends.